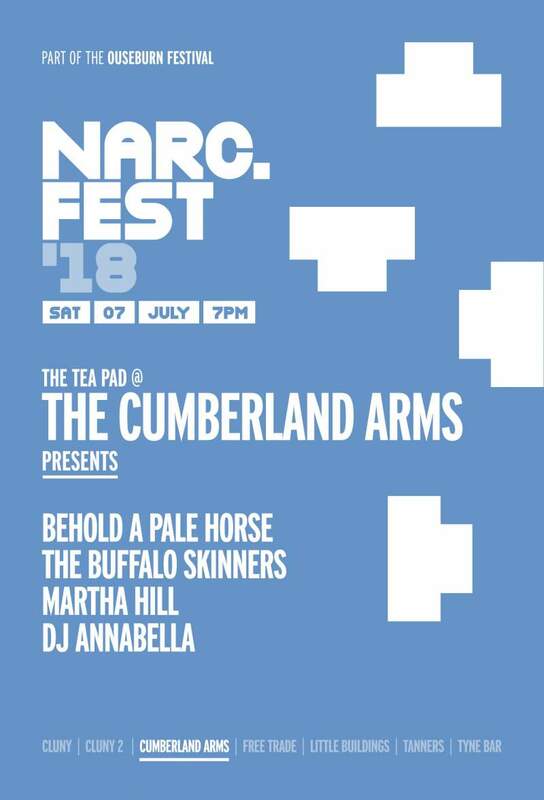 Taking place on Saturday 7th July, NARC. Fest will, for its 11th year, take over the Ouseburn Valley with a series of free gigs! We’ve handpicked some excellent local promoters who have curated line-ups which span all genres and styles and we’ll be announcing them all over the coming weeks. We can also exclusively announce today our venue for the official NARC. Fest after-show party will be Cobalt Studios. The artist-led creative hub will provide the soundtrack to your night if you’re looking for a boogie, and a place to chill out if the glut of live music has got too much throughout the evening. We’ll be announcing the line-up soon! The Buffalo Skinners are the only ‘out-of-town’ band, but they are one of my favourite UK bands at the moment, they will be sandwiched by the delicate yet angsty songs of talented Martha Hill, and the heavy sounds of Newcastle band Behold A Pale Horse. In between and after the bands, local celeb, DJ and fashion icon Lady Annabella of Jesmond will be playing her selection of 60s pop, soul, Latin and Tarantino-esque sounds.